Congratulations to Lorien & John for their wedding across the pond this week! This lovely couple chose to use our Pictorial design with imagery to match their wedding at a beautiful country home. The soft blue-green and gray colors of this design have us dreaming of the English countryside in the spring. 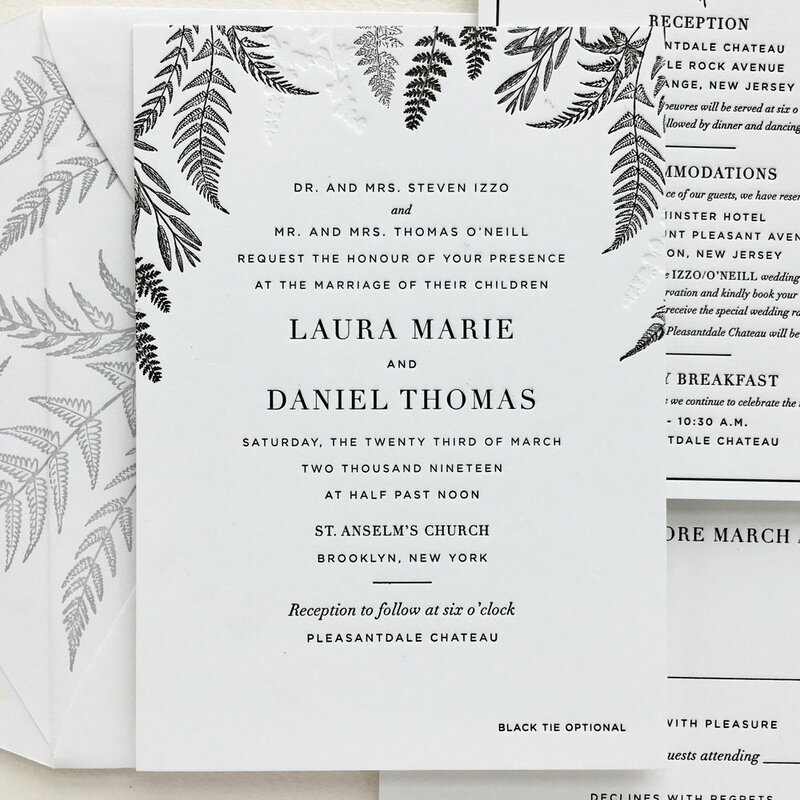 Thank you New York Magazine Weddings for including our wedding invitation in the Spring/Summer invitation feature "9 Wedding Invitations With a Touch of Wild"! We designed and printed these pale green wedding invitations for a sweet couple getting married at Blue Hill at Stone Barns this Spring. The invitation set is based on our Pale Floral design, but with a minty green twist. Each card features a different floral arrangement in green with charcoal gray text which looks lovely on a soft white paper. These letterpress invitations feel like a breath of fresh, spring air and are helping us get through the winter blues. These peach and gold letterpress wedding invitations were based on our Vintage Dot suite, an Art Deco style. Printing this bright color combination was a treat. The peach ink lent a modern touch to a somewhat formal design. Overall, the style was perfect for this Spring New York City wedding at The Bowery Hotel. It's always fun to add sweet touches like this dotted heart to a card. We like to make each card unique, but use similar elements so that the wedding suite is cohesive. We're finally starting to see little signs of Spring everywhere, and that has us seeing green. We have a lot of green on our online shop, like these letterpress clover and beetle greeting cards and new clover coasters. A beetle is only this cute when its printed on a card in neon green, and not scurrying around your home! We printed these sweet letterpress bookmarks celebrating the release of a book by Brooke Dierkhising called Many Ways to See the Sun. The illustrations of the rabbit and feather were originally watercolors, and they look beautiful printed in this cheerful blue. Here's a close up of the bookmark while on press. The blue ink is so striking on the rollers and the plate, but softens a bit when printed on a warm white paper. I have been visiting the High Line with my daughter since the week it opened in June 2009. It has been one of our favorite escapes in the city since that first visit. We love it year round. I like seeing which plants are in bloom and my daughter looks forward to the gelato and ice pops (ok, we both look forward to those). It was one of the highlights of my career then, to be invited to the Friends of the High Line office last spring to talk about a collaboration. They gave us a High Line Plant Guide, detailing the many gorgeous plants that bloom in the park throughout the year. Inspired, we created a set of letterpress coasters featuring vintage illustrations of ten of the flowers. These are now available on their website at www.thehighline.org/shop. Although we have a lot of letterpress coasters around the house, this set if my favorite as it is a tiny part of the High Line in our home. Plus, it's really nice to have some flowers around in this frigid season. Check out their website for history and photos of this amazing park and all the beautiful products for sale. Now that Spring is kinda, sorta on its way, we've designed a brand new set of notecards. Even if it's snowing outside the window of our studio, at least we can make it feel sunny and bright on our presses! We've designed a set of 20 cards, featuring four different designs, each in a pretty, pastel color. The hot air balloon is in a dusty light blue, the chandelier is in a gorgeous pink, the giraffe is rich charcoal and the flower bouquet is printed in a beautiful sunflower yellow. Purchase a set here and bring some sunshine to anyone you send a note to! We've really loved collaborating with West Elm to design plates and platters this year. They've been so nice to work with and it's been fun to see our work on something other than paper. Our Spring Garden plates are now available in West Elm stores and on their website.